After Microsoft Studios closed Lionhead and Press Play earlier this year, a few of the guys at Press Play decided to turn it into an opportunity to start their own company. Thus, Ghost Ship Games was born. 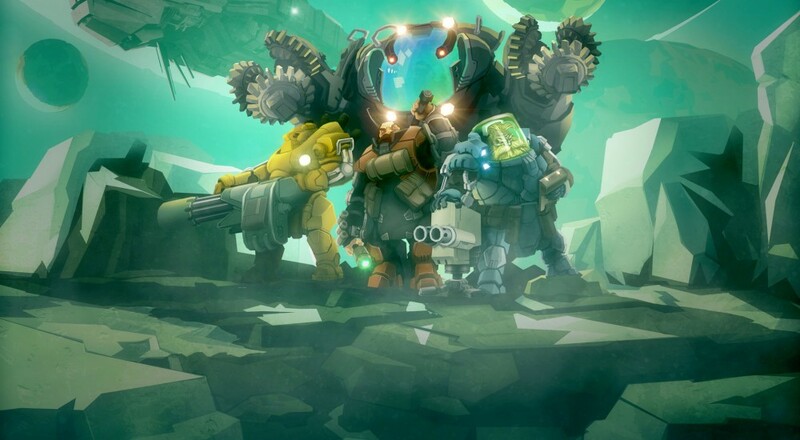 The company has an intriguing motto ("Co-op First") and their first title, Deep Rock Galactic, has been pitched as "Left 4 Dead meets Minecraft." We spoke with CEO Søren Lundgaard about the game and how their studio (and motto) came to be. Søren Lundgaard: Yeah, we hoped our motto would intrigue you. Well, Ghost Ship Games was born not so long ago, more specifically in April 2016. We worked at Press Play, when Microsoft decided to close the studio along with Lionhead. It was a unique opportunity to start our own independent studio and within a week we had a game project going. Since then, progress has been lightning fast and we are quite happy about the game and our current situation. We are six founders of Ghost Ship Games and all of us are industry veterans with a very diverse background ranging from big AAA games to small indie productions across a multitude of platforms and eras. It has been very liberating to start our own studio and finally decide on our own game and strategy. So, the motto of “Co-op First” was born in the very early days to direct our efforts. We simply looked at the premise for Deep Rock Galactic, which can be described as “co-op action in a procedurally generated world” and looked at the current games on the market. There are very few games where co-op mode is the primary game mode. There are a lot of games where co-op is a feature often found at the end of the feature list. But for us co-op is the first feature we consider when designing and developing the game. So “Co-op First” fitted that ambition perfectly. Co-Optimus: Putting something like co-op first and foremost in a title isn’t always easy, especially when it’s online and you have to account for a whole lot more than if you just made a single-player experience. Why this emphasis on co-op gaming? What makes it worth it to you all? Søren: Our fascination for co-op started back in the 90s when the multiplayer games like Doom, Command & Conquer, Diablo, Quake and the like appeared. First, we just played deathmatch, PvP, but then we realized that you could play co-operatively in those games. You could play together against the computer, PvE. They didn’t all support it fully, but that didn’t matter. Playing co-op was such a rewarding experience and a very social way of playing, but for the longest time, games didn’t focus on this in a pure form. Then Left4Dead appeared and changed the perception of co-op games - it was possible to market a game with a pure co-op focus. Since then, others have followed in the footsteps of Left4Dead and we believe we have our own take on the co-op action genre. And yes, there are a lot of extra challenges compared to a single-player game, but since we assume that 4-player co-op is the optimal way of playing the game, then the design becomes quite a bit easier. Of course, we will still make the game work in single-player; that is simply required. When you play a new co-op game, you often start in single-player before you go online - you don’t want to be too much of a newbie, right? So, designing for co-op definitely brings its own challenges, but it also brings several advantages we couldn’t do without. For instance, it is dead obvious that you cannot properly test the game yourself - that means we need to do daily play sessions together, which in turn have become a very important factor in the speed with which we can iterate. Nobody wants to submit broken stuff and everybody can easily see what works and what doesn’t. That means, we base a lot of our design on our shared experience of playing the very latest build of the game. Compared to how we did things in the old days, this is a wonderful change of pace.